If people understood the trade deficit and the harm it does, they would demand that our politicians do something to fix it. Trade is great. We all trade. A lot of us trade labor for money that buys other things. A farmer trades corn for money that buys other things, and so on. No one is "against trade." But is anything called "trade" always good for all involved? Imagine you're a farmer and you make a deal to trade corn and wheat to get money for a new tractor. So the farmer orders a new tractor, but the "trade partner" never buys any corn or wheat. After a while the "trade partner" shows up with a big bill, saying the farmer owes money for the tractor. And then the farmer finds out that the "trade partner" plans to use the proceeds from the sale of the tractor to grow their own corn. In modern terms, we would say that the farmer was "running a trade deficit." How much damage do you think that "trade deficit" is doing to that farmer, and the farmer's ability to make a living in the future? How long do you think that farmer would let that "trade agreement" continue? The U.S. is currently running a net trade deficit of over $500 billion dollars each year with our "trade partners." We have been running trade deficits every year since the late 1970s. We buy from them, but they don't reciprocate and buy from us, so the trade is out of balance – way out of balance. These other countries use the proceeds from our purchases to set up their own industries so they don't have to buy from us in the future. We let this happen so as our industries move away we will have no choice but to import. In many cases our own so-called "American" corporations are voluntarily "deindustrializing" and sending the factories and equipment to "trading partners" elsewhere. When a country runs a trade deficit it means that the "demand" for goods and services created by that country's economy is being exported, and people are being hired in other countries instead of that country. It means that the growth of that country's economy and number of jobs available is lower than it would be. Last week's Wall Street Journal report, "U.S. Trade Gap Narrows in January," for example, called our trade deficit "a drag on overall growth." They quantified how much, reporting that, "Net exports—the difference between exports and imports—subtracted 1.15 percentage point from fourth-quarter gross domestic product." In "Stop Currency Manipulation and Create Millions of Jobs," Robert Scott at the Economic Policy Institute (EPI) writes, "Rising trade deficits are to blame for most of the 5.7 million U.S. manufacturing jobs (nearly a third of manufacturing employment) lost since April 1998." Trade policy that encourages businesses to relocate production of goods to other nations without penalizing them for selling those goods back to this nation has resulted in millions of lost jobs. White House estimates show that for every $1 billion in goods exported, the economy creates 5,000 jobs. Unfortunately, that street goes both ways — data from the Economic Policy Institute shows that for every $1 billion in goods imported, the economy loses 9,000 jobs. This massive loss of jobs, of course, has an effect on wages. This chart, from the post, "Does Trade Deficit Drive Inequality?" 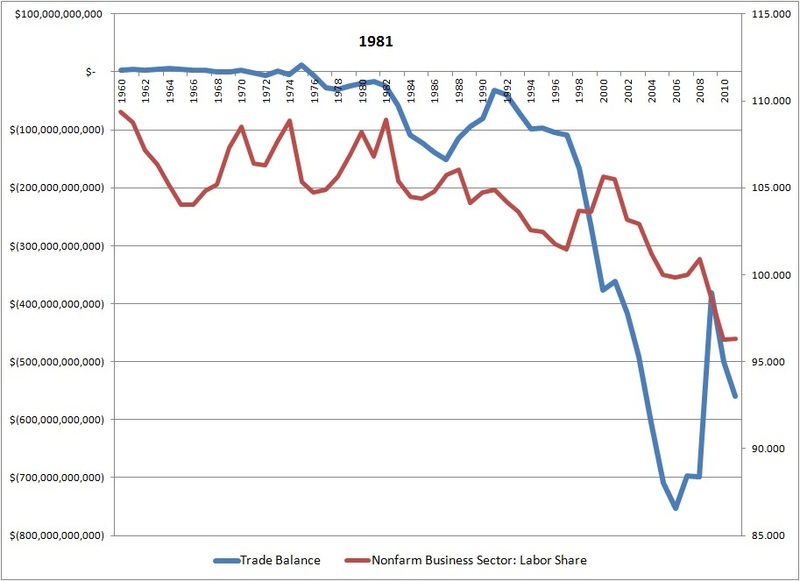 shows the correlation between the trade deficit and the way people's wages stopped rising along with productivity in the late 1970s – the same time as the trade deficits started putting downward pressure on wages. In other words, regular, working people stopped sharing the benefits of improvements in our economy. The ongoing trade deficit has hamstrung our economic recovery and continues to threaten to derail it. The Washington Post's Wonkblog recently explained that danger, using this long headline: "The one thing that could cut the economic recovery short: If you want a picture of the recovery's future, imagine a trade deficit stamping on the economy's face—forever." ... Whenever one part of the economy takes off, like consumer spending has now, another falls off, like net exports. The difference now, though, is that, for the first time, you can see the potential for the recovery to break out of this cycle, and finally take two steps forward. ... But there's only so far these things can grow—people can't keep spending more unless they save less—which is why we can't afford for the trade deficit to be a persistent drag on GDP. How long have we – the United States – been letting that continue? We have been running trade deficits every single year since the late 1970s, when the neoliberal "free market" and "free trade" ideology came to dominate our thinking. This didn't just happen. It had the help of billions of corporate and billionaire dollars invested in conservative "think tanks" and other PR and marketing efforts to convince the public that privatization and "trickle down" and tax cuts and letting corporations handle things instead of We-the-People government was the best way to do things. Since the late 1970s American corporations have been closing factories here and replacing with them factories elsewhere. We have been moving entire industries out of the country, and not bothering to compete for new, strategic industries of the future. Why Does This Continue? Protecting Investments Over People. Our free trade policy encourages production to leave the country. We've lost millions of manufacturing jobs. More than 60,000 manufacturing plants were closed between 2000 and 2010 as production moved overseas. These costs are real. [...] Free trade agreements are bad for millions of people because they are not really about trade. More importantly, they limit the political process so investors are relieved of responsibility for protecting the environment OR recognizing labor rights or human rights, OR dealing with public health OR worrying about prudent financial regulation. Sorscher says here that protecting investments over people results in "downward pressure" on everyone except the investors. It means lower environmental protection costs for corporations. It means lower costs for protecting health and safety and rights. It means higher unemployment, which means downward pressure on wages. Lower wages and other such costs are great if you are an employer, but of course are bad for the rest of us. Trade deficits must be financed. A country simply cannot have a trade deficit unless private or government investors are willing to finance it. This is not simply an accounting convention – it is real debt. [...] But why isn’t the government, Wall Street, multinational corporations, and many pundits and bloggers worried about the growing trade deficit? Why is the trade deficit largely ignored while everyone is more concerned about the federal deficit? Wall Street, the Multi-national corporations and the Obama Administration have adopted a policy of appeasement where foreign mercantilism seems to be irrelevant and attempts at balancing trade are ignored. It is as if the trade deficit is an open-ended charge account that is simply an accounting summary that will never have to be paid back. He is not quite saying that Wall Street and our government are financing our trade deficit in order to keep jobs scarce and therefore wages low – just that this is the net result of policies, decisions. This continues because we – the United States as a country – do not have national industrial/economic policies that recognize the U.S. as a country with national economic interests. Instead, our leadership and opinion elite have been convinced by the ongoing conservative campaign that government should not "interfere" and that acting as a country to protect our national economic interests – known as "protectionism" – is bad. Meanwhile other countries are doing exactly that, and their economies and industries benefit from it. This ongoing trade deficit has transferred trillions of dollars out of our economy. It has cost us millions of jobs, tens of thousands of factories and entire industries. As it continues it is costing us our ability to make a living as a country – except for our financial sector. This has made a very few people unimaginably wealthy, but it has made the rest of us, and the country, poorer. If people understood the trade deficit and the harm it does to approximately 99.9 percent of us, they would demand that our politicians do something to fix it. And if that happened, great things would happen for working people and our economy.